Learn how KishHealth System improved the response time of its electronic rmedical records system and provided scalability for its PACS with HP Converged Storage. 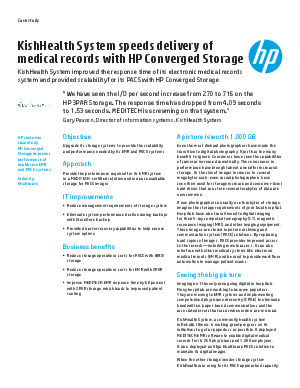 "We have seen the I/O per second increase from 270 to 716 on the HP 3Par Storage. The response time has dropped from 4.09 seconds to 1.53 seconds. MEDITECH is screaming on that syste. Gary Paxson, Director of information systems, KishHealth System"